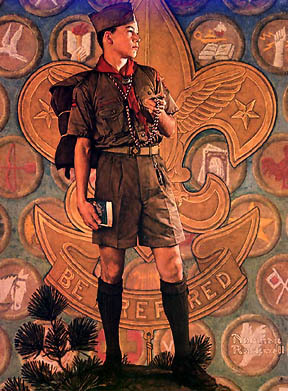 The Boy Scouts have been training boys to become leaders capable of making moral, civic minded decisions for 100 years. How do we accomplish this goal? To read about the aims and methods of Boy Scouting Click here. Troop meetings are every Monday night, from 7:00 pm to 8:30 pm, in Fellowship Hall of Red Clay Creek Presbyterian Church, 500 McKennans Church Road, Wilmington, Delaware. On occasion, meetings are held off-site and notice of these are given in advance. Our scouts are organized into patrols which function as independent units within the troop. Each patrol is comprised of 8-10 scouts and they vote every six months for their leader. Additionally, each patrol may meet outside of the troop and may even pursue their own camping program or other activities, if they choose. Of course, these are done in addition to the troop program and don't conflict with those activities-but they help form a stronger bond between patrol members, and this leads to strong patrols. New scouts are organized into a separate patrol and, depending upon the number of new scouts each year, are encouraged to express a preference for one of the existing patrols. Currently, we have six patrols in our troop. Each patrol is issued a compliment of equipment for camping for which they are responsible. It is the PLC's (Patrol Leaders Council) policy to have a Senior Patrol Leader elected by the scouts twice each year. Candidates for this position express interest to the Scoutmaster. Candidates must review the job description and commit themselves to attending meetings and outtings during their term of office since they are expected to be leading the troop. Once elected Senior Patrol Leaders will select, an Assistant Senior Patrol leader and a slate of warrant officers. Each six months, patrol leaders are elected by scouts in each patrol. Patrol leaders will then select their patrol warrant officers. Leadership training is provided to the PLC regularly. The boys operate through the Patrol Leaders Council (PLC), which meets once per month or so, to plan and execute the scouting program. The PLC meetings are attended by the Scoutmaster and one Assistant Scoutmaster, who advise and mentor the council on decisions. The Scoutmaster must approve the PLC plans as having met troop goals and BSA guidelines. The PLC evaluates the performance of elected and selected leadership positions and determines whether such leaders have performed their duties. Leaders may be removed at the discretion of the PLC or Scoutmaster if they fail to meet the responsibilities necessary to earn leadership credit for advancement. The Adult Uniformed Leaders consists of a wide variety of individuals from many different backgrounds who contribute their time and energy to making the troop work. Each Assistant Scoutmaster can choose an area of interest to pursue and determine the amount of time and commitment they feel comfortable to giving the troop. Assistant Scoutmasters report to the Scoutmaster, who has ultimate decision making regarding troop operations and programs on a day-to-day basis. Patrol Leaders and Warrant Officers report up through their Assistant Senior Patrol leaders to the Senior Patrol Leader. The Unit Committee meets once each month and ultimately oversees the Scoutmaster. The Committee is also responsible for serious disciplinary actions, budgeting, Charter Organization relations, policy formulation and special events planning. Currently, dues are $75 per year, which includes advancement recognition, a subscription to Boy's Life magazine, Council insurance, and a small administrative fee. New Scouts pay an additional one time fee of $30 which is then returned to them in the form of a Troop 29 Neckerchief, a Boy Scout Handbook, A T29 number block, and Green Boy Scout epauletes. Troop 29 operates on an a'la carte basis for camping activities with each scout choosing to participate in an event and funding that event. Activities are planned on a break even basis. Some camping trips will require additional costs to be paid. Summer Camp and High Adventure trips are priced separate from other camping activities and usually have payments spread throughout the year, to soften the economic effect on families. Additionally, scouts can earn funds through participation in troop fund raising activities which can be applied to their activity accounts to apply toward any trip or other cost associated with the troop. These fund raising activites vary depending on the decision of the PLC. Financial aid is available for families in need. If you believe you are in need of such assistance, please see the Scoutmaster or Parent Committee Chair as early in the registration process as possible for additional information. Personal equipment for camping (ie. Sleeping bag/pad/mess kit etc.) and a official Boy Scout uniform are required for scouts to participate in our troop. Help in getting these materials is also available on a need basis. The Boy Scout advancement program is exciting and fun, while placing a series of challenges in front of the scout which need to be met. Self confidence is built through the successful mastery of these skills. Each rank advancement requirement must be met, before a scout can request the paperwork necessary to be tested and reviewed. Generally, the requirements are signed off by a qualified member of the troop for each scout, in their handbook for ranks through First Class. Merit badges may be completed using a troop form or BSA Blue Card. The ultimate advancement rank is Eagle Scout, of which approximately four percent of all scouts achieve nationally. Additional details on the process of advancement can be found in a separate area of this web site. Troop 29 is open to all regardless of ability, race, color, religion, ethnicity, or economic background. America was built strong through diversity and so has our troop. No discrimination will be tolerated. We encourage and welcome all parents to participate in any leadership role. All adult leaders must undergo a criminal background check. Physical fitness forms are required annually of uniformed scouters. All adult leaders are approved by the Charter Organization. High Adventure trips and other activities may at times be limited to those people physically fit enough to participate. Such determination will be made by the Scoutmaster. It is difficult to experience the awesome beauty of nature in its wilderness state and not be humbled by her and her maker. Our scouts are encouraged to practice their beliefs actively in regard to the divine. Troop 29's Chaplain Aides offer interfaith services at all camping activities and Troop meetings are always closed with a prayer. All religions are welcome in our troop. Every scout deserves a trained leader. Troop 29's adult leaders have all achieved BSA Trained Status. Training is a key component to our leadership objectives both for our Scouts and for their Leaders. To learn more about Troop 29's leadership training Click here. Register to receive email communiations about the trip by using the box below. You will receive an email at the same address you enter here requesting confirmation of receipt. This is to be sure your spam filter is not trapping our messages. All emails are validated by troop personnel. Please allow time for account verification and approval.